The Netherlands is a fascinating country, and in many ways may be the prototype for the future of humanity. The Dutch are well educated, and probably the most fluent nonnative English speakers anywhere. Theyre an innovative people, too. From the Red Barons Fokker DR1 Triplane (designed by Anthony Fokker) to the Compact Disc (codeveloped by Philips and Sony), the Netherlands has a long tradition of being at the technological forefront. Surely one of the most innovative companies in the Netherlands today is Crystal Cable. This sister company of renowned cable maker Siltech has become quite a presence among audio companies in the past few years, taking both reviewers and consumers by storm. What makes Crystal Cable different is obvious to anyone whos seen their cables: theyre very thin. Compared to some of the unbendable fire hoses now available, Crystals speaker and power cables are positively Lilliputian. But unlike the ropes that failed to restrain Gulliver, Crystal Cables wires are engineered to be more than capable of handling any signal thrown at them. Note the verb in that last sentence. Engineered is not a word universally applicable to audio cables, but its appropriate here. When Doug Schneider visited Crystal Cable and Siltech in Holland last spring, he was shown an arsenal of expensive laboratory-grade equipment used by both companies in the design of their cables. Thats what youd expect in a shop run by someone like Edwin van der Kley, whose training is in electrical engineering, and whose well-trained, obviously creative mind conceived the Crystal Cable Bridge ($780 USD per 1m pair). Describing the Bridge isnt easy. Its a sort of interconnect. Its a cable tweak. Its a filter. Link two audio components with a Bridge and youll get the sweet sound of silence -- its not a standalone cable. Instead, the Bridge is designed to enhance ordinary interconnects by . . . well, Im not exactly sure what it does, though I have a theory. But before I expose the depths of my electrical ignorance, I can at least describe what the Bridge looks like. 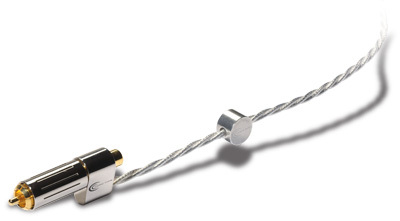 Like Crystal Cables other products, the Bridge looks like a piece of audio jewelry. Also like its brethren, the Bridge features tightly braided strands of Crystals thin cabling -- in this case, two clear-sheathed, silver-shielded cables link the negative-pole sections of the unusual hermaphroditic connectors that terminate each end of a Bridge. What the heck is a hermaphroditic connector? Why, its a connector thats both male and female. Of course. The Bridges unique connectors should really be thought of as input (female) and output (male) terminals, as on a preamp -- but even this description requires some modification, because here, too, the Bridge is incomparable. As far as the positive half of the signal is concerned, the Bridge is simply a pass-through device. When inserted into the Bridge, the central prong of an interconnect cables connector is linked directly to the same part on the Bridge. Its on the negative (or return) half of the audio signal that the Bridge goes to work. Now for some physics and my little hypothesis. First, the physics: Why does an electrical current make a toasters elements red-hot, but seems to have no thermal effect on that same toasters power cord? The answer is resistance. Toaster elements are made of an alloy, typically of nickel and chromium, that is a very poor conductor of electricity -- the elements provide so much resistance that its very difficult for an electrical current to flow through them. As we learned in high school, energy can be neither created nor destroyed, only changed into another form. In this case, the elements resistance turns electrical energy into heat, and we get toast. But the toasters power cord is made of copper, which is an excellent, low-resistance conductor. Some of the electrical energy in the cord will still be converted to heat (zero electrical resistance isnt yet possible at room temperature), but probably not enough to be noticeable. What does a toaster have to do with Crystals Bridge? Quite a lot. The DIY cable community has long held that having more wire on the return side (e.g., one strand on the signal, two on the return) makes for a lower-noise cable. The theory goes that any extraneous electrical energy (noise) picked up by a cable can be more easily drained away to ground along the path of least resistance. In the Bridge, that path is ultra-high-purity silver-gold wire, whose resistance is so low as to be almost unmeasurable. Could it also be that doubling up the return path also prevents a bottleneck in which the signal jumps to the return leg? Think about it: If noise is added to the signal inside a component, that signal, when it enters a single-stranded return leg, might face a situation not unlike two people trying to go through a door at the same time. But when two or more return strands are present, theres plenty of room for everyone. Im talking out of my assumptions here, but when official data arent available, a guys got to at least try to explain things. The doubled return wire isnt the only trick up the Bridges sleeve. Buried inside its connectors is what Crystal Cable calls an HPSR silver-gold filter of 99.9999% purity. Crystal doesnt elaborate on what exactly the filter is (a capacitor/inductor/wooden shoe/cheese? ), but they do say that it operates in the greater-than-20GHz range. Again, as Ive given myself free rein to speculate, Ill point out that the HPSR filter might be a very small capacitor, perhaps like the high-purity silver-gold capacitors made by Germanys Mundorf. Now, if the Bridge did nothing for the sound -- or [gasp] made a cable sound bad -- it wouldnt matter if its connectors contained freeze-dried cells from Einsteins brain. How fortunate that, in the listening, the Crystal Cable Bridge proved to be pure audio genius in physical form. A Simaudio Moon i3.3 integrated amplifier also served as a USB D/A converter. When the i3.3 wasnt DACing, I used Simaudios matching Moon CD3.3 disc player. The speakers were Focus Audio FS8s connected to the amp with Supra Cable Ply 3.4/S cables. AC cords were Synergistic Researchs T3 (Moon i3.3) and T2 (Moon CD3.3), with Synergistics Tesla Tricon USB cable linking my audio PC and the Moon i3.3s USB input. The interconnects I used are discussed below. I said above that the Bridge is incomparable, but thats not really true. When I compared the Bridge to no Bridge there was a very noticeable difference in sound, and that formed the basis for my observations: Bridge on vs. Bridge off. I wrote a separate paragraph for each of the five pairs of interconnects I used with the Bridge, but then I noticed that those paragraphs all read the same. Whether it was DH Labs White Lightning and Pro Studio, Synergistic Researchs Alpha Quad Active, Furutechs FA-13S, or TARA Labs RSC Prime, the results were almost identical. What was fascinating was that the differences in sound werent on a sliding scale, with the cheapest cable making the greatest change and the priciest wire the least. Instead, when the Bridge was in place, all seemed to enjoy the same benefits to the same degree. Therefore, to reduce redundancy, I discuss here only the general results, which are applicable to all of the interconnects listed. But note: I am not saying that the inexpensive White Lightning sounded as good with the Bridge as did the RSC Prime, only that the improvements I heard in each cable were of equal proportion to the improvements I heard in the rest. It seemed that the best way to hear what the Bridge could do was to have it in place, listen, remove the Bridge, then listen again to the same recording. This way, I would hear what, if anything, was missing or different when the cables stood on their own two connectors. I mostly used two recordings: David Berger & the Sultans of Swings Hindustan (CD, Such Sweet Thunder SWTT 1004), and Dave Brubecks So Whats New? (CD, Telarc CD-83434). But again, the results for these albums can be extrapolated across the musical spectrum -- the improvements I heard with these recordings were also apparent in others. Whoops -- did I say "improvements"? I guess the cats out of the bag. What I heard from the Bridged cables was nothing short of remarkable. With the Bridge out, the double bass and kick drum on the Berger CD blended together so that when the bass went low, the drum was indistinguishable from the plucked note. Bridged, the bass and drums separated like oil and water, and sounded tight and punchy, not ill-defined and mushy. Trumpet and saxophone had nice tonality, but their true metallic timbres werent fully realized unless Bridged. Neither was a tambourine struck by the drummer: without the Bridge, I hadnt even noticed it was there. Bobby Militellos alto saxophone on Brubecks So Whats New? was also very revealing. With the Bridge out of the loop, the sax held tight to the right speaker, which was very easy to localize. Bridged, not only did the sax float freely, just to the left of center stage, but the speakers nearly "disappeared" and the soundstage widened considerably, giving the recording a nice, spacious feel. This sax and trumpet, too, had wonderful bite, so much so that they may have left teeth marks -- the kind of metallic bite that has texture, the kind you can almost see come streaming out of the instruments. Awesome. Something else the Bridge provided in spades was focus. I heard this especially with cymbals, where attacks went from a fuzzy shhh to a distinct tink before the rest of the metal began to vibrate. This effect was notable with the China Boy cymbal on "Keep On Runnin," from Y&Ts Ultimate Collection (CD, Hip-O 490889), which normally sounds like a furious librarian hissing an imperative "SHHHHH!" to someone a long distance away; with the Bridge attached, it was so much more. Again, the stroke of the drumstick was clearly audible in the milliseconds before the entire China Boy began to resonate, and the cymbals bloom was so apparent it was practically a visual effect. What was more remarkable was that the bloom -- and here Im talking about the sense of the sound not merely increasing in volume, but growing in space -- was clearly evident on even the three quick strokes that occur in this songs chorus. Here, with the cymbal producing a SHHHHH! SHHHHH! SHHHHH! series in less than one second, anyone might reasonably expect that the resulting clouds of treble would blend together like so much high-pitched mush. Amazingly, they did not: the Bridge focused the music to such a degree that, despite the short interval between each pair of strokes, the first two strokes resulted in a bloom of cymbal sound that was as clearly discernible as it was brief. Were faced with the $780 question: Does it make sense to spend that kind of money on a cable tweak, or are you better off with a new set of interconnects? The Crystal Cable Bridge is technologically innovative, and I have no doubt that it will help most cables sound their best. Nor does it hurt that its beautifully made, and represents the least expensive route into Crystal Cables line of accomplished products. But does the Bridge (plus your existing cable) represent the best value for your cable budget? Unfortunately, theres just no saying with any kind of authority. The Bridge will very likely get you more from your existing cables, and will also likely serve as an excellent supercharger for those who already own Crystal Cable interconnects. The only way to be sure that the Bridge is right for you is to audition it at home -- something I heartily recommend to anyone looking to take his or her system up a notch. Its hard to classify and harder to understand, but the Crystal Cable Bridge is highly innovative and sounds great . . . whatever it is. I dont know what to call it, but I know I like it. I like it a lot. Price: $780 USD per 1m pair.